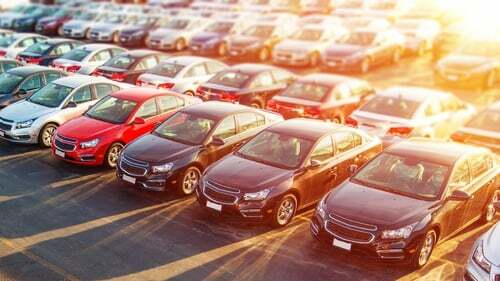 New car sales were down 12.6 per cent in January. New car sales are down 12.6 per cent - with 32,374 cars registered in January - and the lower value of Sterling is continuing to drive down the value of second-hand cars here. Sales of electric cars, petrol models and hybrids are increasing, however. The latest figures from the Society of the Irish Motor Industry for new year car sales show a drop of 12.6 per cent for January registrations. Car sales were 32,374, compared to January 2018 when 37,023 were registered. Van sales were down 16.3% (5,650) and trucks were down 11.4%. The SIMI says that despite the steady levels of growth, "the motor Industry faced a significant and uncertain year with monthly declines in new car registrations figures, reflecting the substantial impact of Brexit. Used car imports in 2018 reached the highest level on record at 100,755 accounting for 44.5% of the total car market in 2018 but are slightly down in January (0.6%) when just over 9,000 cars were imported. "Sterling weakness and Brexit related uncertainty were the key drivers in 2018 and have continued to be a characteristic of January 2019. The dampening of new sales volumes has affected both the car and commercial sectors and until the 29th of March this deep uncertainty will continue". Electric car registrations are up significantly. Electric vehicle registrations increased significantly with 811 registrations in January 2019, which is more than for the whole of 2017 and over 60% of the total for the whole of last year. This is a jump from less than 1% of the market last year to a 2.6% market share in January this year. Jim Power, Economist and author of the SIMI Report said he expected used imports this year to reduce marginally to around 98,000. However, in the event of a ‘no-deal’ Brexit, sales would be weaker, and in the event of a deal and the removal of uncertainty, sales could match 2018. In overall terms, the coming months are likely to be characterised by deep uncertainty." The high volume of imports is making life difficult for those either trying to sell, or trade-in, a used car. Many people are finding that they are not being offered what they expected and are finding the amount they have to pay to change to a new car is much greater. Referring to this problem, Brian Cooke of the SIMI said "the weakness of Sterling is continuing to drive down used car values which is increasing the cost to change.